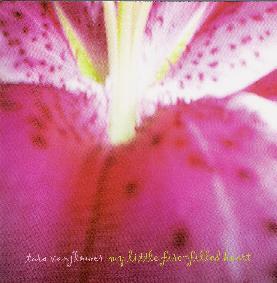 Lycia - "Estrella" / Tara Vanflower - "My Little Fire-Filled Heart"
Estrella is the remastered Silber Records reissue of the last Lycia album from 1998. The band is the duo of Mike VanPortfleet on guitars, drums, synths and vocals and Tara Vanflower on vocals. My introduction to the band was the Empty Space CD (see AI #26), a very nice set of dark, Gothic, atmospheric synth-pop songs. I enjoyed Empty Space, but Estrella is a thoroughly seductive space symphonic set of ethereal Goth music. To call this music hypnotic would be an understatement. 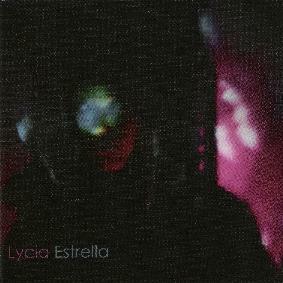 I'm not too clued into the Darkwave/Goth scene, but I love the way Lycia wrap heavy walls of spacey keyboards around gorgeously melodic flowing instrumentals to create a slow, dark, ambient intensity. Both VanPortfleet and Vanflower contribute vocals, though they really serve a function equal to the instrumentation. The music is deeply spacey, sometimes bringing to mind something Tangerine Dream might sound like if they were a Goth band. Mood and ambience are key elements, and Lycia excel at creating an atmosphere that is just as haunting as it is uplifting. Songs like "El Diablo" and "The Canal", those with the heaviest symphonic keyboards, were among my favorites, as these also tended to be the most cosmic tunes and the ones with the most bewitching melodies. "Tainted" is a similar highlight that includes cool alien electronic embellishments. And "Silver Sliver" is like a spaced out Gothic kind of torch song. A hauntingly beautiful album. Last year Mike VanPortfleet released his Beyond the Horizon Line solo album (see AI #29), and now Tara Vanflower takes a solo outing (her second) with My Little Fire-Filled Heart. This took me a bit by surprise, being very different from the music Lycia produces. Tara explores experimental music territory, creating music that is freeform and sometimes abstract. Yet the results are curiously accessible, and a bit unique, mostly due to the vocals and Tara's ability to construct floating moods and atmospheres within a general avant-garde framework. In some ways Tara reminds me of Laurie Anderson, a female artist who many years ago found a measure of mainstream success by also combining experimental elements with something anyone with a little open mindedness could warm up to. Among the highlights is "Yaya", which combines multiple voice layers with drones to create an avant-garde chanting church congregation. "Rabbit" blends childlike song, spoken word, light percussion and tape collage sound manipulations. "Silverback" is one of my favorites, blending the sort of drones, voices and spoken word heard on "Yaya" with experimental sound constructions. Lots happening here, but as usual Tara keeps the focus on the mood of the piece. "I Lost The Moon" is a standout track, featuring some of the most abstract yet absorbing music of the set. "A Conversation With Death" is yet another highlight that does an excellent job of blending avant-garde soundscapes with song. Always captivating, Vanflower left me with much to absorb and digest, revealing new bits and pieces with each subsequent listen of this pleasantly challenging album.